John Hoppes died in Buffalo, New York on this day in 1918. 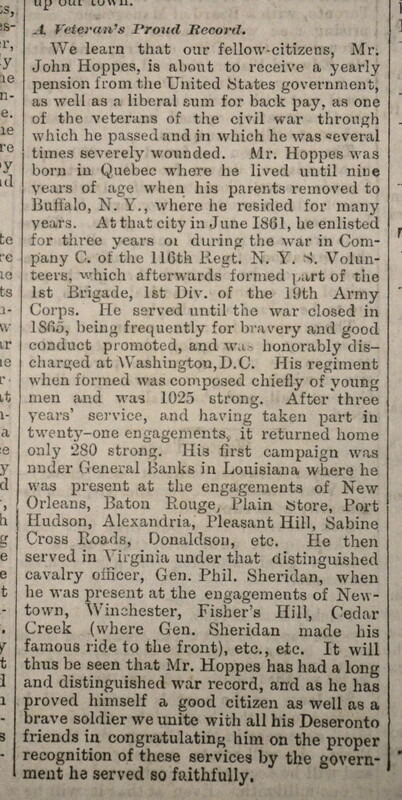 He was not a veteran of the First World War, but served in the American Civil War between 1862 and 1865. He was born in Quebec in 1846 and was a resident of Deseronto between about 1879 and 1899. He worked as a millwright in one of the Rathbun Company’s mills. We know about him from a newspaper article published in Deseronto’s Tribune on August 3rd, 1888 (coincidentally, 30 years to the day before he died). We hear that [one of] our fellow citizens, Mr. John Hoppes, is about to receive a yearly pension from the U.S. government as well as a liberal sum for back pay, as one of the veterans of the civil war through which he passed and in which he was several times wounded. Mr Hoppes was born in Quebec where he lived until nive years of age when his parents removed to Buffalo, N. Y. where he resided for many years. At that city in June 1861, he enlisted for three years during the war in Company C. of the 116th Regiment New York State Volunteers, which afterwards formed part of the 1st Brigade, 1st Division of the 19th Army Corps. He served until the war closed in 1865, being frequently for bravery and good conduct promoted, and was honorably discharged at Washington, D.C. His regiment when formed was composed chiefly of young men and was 1025 strong. After three years’ service, and having taken part in twenty-one engagements, it returned home only 280 strong. His first campaign was under General Banks in Louisiana where he was present at the engagements of New Orleans, Baton Rouge, Plain Store, Port Hudson, Alexandria, Pleasant Hill, Sabine Cross Roads, Donaldson, etc. He then served in Virginia under that distinguished cavalry officer, Gen. Phil. Sheridan, when he was present at the engagements of Newtown, Winchester, Fisher’s Hill, Cedar Creek (where Gen. Sheridan made his famous ride to the front), etc. It will thus be seen that Mr Hoppes has had a long and distinguished war record, and as he has proved himself a good citizen as well as a brave soldier we unite with all his Deseronto friends in congratulating him on the proper recognition of these services by the government he served so faithfully. Hoppes enlisted in Buffalo on July 28th, 1862, according to the Grand Army of the Republic records at New York State Archives (available through Ancestry). He moved back to the US from Deseronto in around 1899 and was working as the superintendent of a cement works in Margaretta, Erie, Ohio in 1900. By 1905 he, his wife Margaret and their youngest child, Ida, were living in Buffalo. The last address we have for John was 430 Normal Avenue. He died on August 3rd, 1918 and was buried in Buffalo’s Forest Lawn Cemetery. Hoppes’s grandson, John James Hoppes, joined the Canadian Expeditionary Force in Kingston in June 1918.